Who would not want to celebrate at least once a year a wonderful plate of ribbon pasta cooked with butter and parmesan cheese? Most don’t know that pastas was actually seldom served at American tables 100 years ago. The age of mass production of foods and their distributions coincided with the discovery of Italian foods. The rest is history. B. The original recipe for Fettuccine “Alfredo” is pasta made from fettucine noodles tossed with one part parmesan cheese and 3 parts butter. 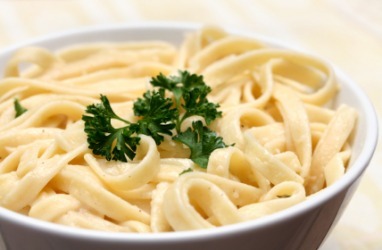 Alfredo sauce is the emulsified liquids that form the smooth and rich coating on the pasta. C. It was named by an Italian restaurateur at his restaurant Alfredo on the Via della Scrofa in Rome in 1914. Said to have been a dish he made at home but for years was too reluctant to sell to his customers because it was so rich. D. Douglas Fairbanks and Mary Pickford, early movie stars, fell in love with the dish while on their honeymoon in 1927. This helped to make the dish and Alfredo world famous. E. There are authentic “Alfredo’s” restaurants in the US, Alfredo’s at Rockefeller Center in New York City is the most well known. 1804 John Deere was born. Inventor and manufacturer, he developed the first steel plow in 1838. The mass production of the plow helped make farm yields per acre increase 10 fold within two decades. 1894 Antoine-Joseph (Adolphe) Sax died. A musical instrument maker, he invented the saxophone. The shape was said to have been patterned after plumbing pipes and first constructed by a pipe fitter. 1989 It was reported that a “rain of sardines” fell in Ipswich, Australia. The rain was said to have taken place for over 15 minutes littering the town and countryside with fish and frogs.